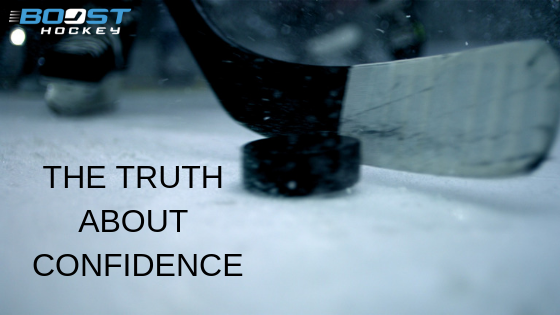 Confidence is another one of those terms we hear about all the time in hockey. It's absolutely vital for players and teams to have it in order to be successful. I mean it makes sense, if you're playing well you're playing with confidence, and on the flip side, if you're struggling you're probably lacking confidence. While none of that is earth shattering to any of you, there is one thing that really amazes me about people and their confidence and the way they think about it. Confidence, at its core, is solely individual based. In other words, no one can give you confidence. As a coach, I can sit and talk with a player everyday and tell them how great I think they are, but unless they actually believe it, they won't be confident. That doesn't mean that exterior factors (like a supportive coach) don't play into the overall building of confidence, because they do. But at the end of the day, it comes down to you as the individual to believe in yourself and your abilities. To back track for a minute, the exterior factors that I'm referring to are having a positive and healthy support system surrounding you. That can include teammates, coaches, family, and friends. You need people in your life who have your back and are there to support you through the good and the bad. These things help build confidence. But, just to clarify again...these things are there to help build confidence, but aren't the ultimate reason you're confident. You are confident because you know it and believe it deep down in your heart and mind. So what's one thing you can do today to help build your confidence? Focus on the small successes. To often, we only focus on huge massive victories as the only real measures of success. Now, while these are absolutely beneficial to becoming more confident, they aren't sustainable enough to help us build our confidence everyday. Another way to think about it is that we can't win a state championship everyday...it's just not possible. However, we can (and we should) be working on our confidence everyday. It's amazing how much of a difference focusing on small things can help build your confidence up everyday. Things like blocking a shot, making a tape to tape pass, winning a 1 on 1 battle, taking a hit to make a play, having an active stick and breaking up a scoring opportunity... the list can go on and on but I hope this gives you a glimpse of what I'm talking about. I think the real turning point for me was when I got to Culver. We won a close game 3-2 where I scored a couple goals, including the game winner with only a few minutes left in the third period. I ended up having a conversation with our coach about the game the next day. He told me he thought I played really well. My initial gut reaction was that I agreed with him but I figured he said that just because I scored a couple goals. But the more we talked, he never talked about either goal once. Instead, he talked about what he thought was a big turning point was when we were short handed late in the second period and I had a big shot block. To be honest, I had forgotten about the play until he brought it up. His second point that he brought up was another play that to most casual observers was lost in the mix. He talked about how on the backcheck on a play in the third period I read the play well and picked up their late third guy joining the rush and prevented him from being a scoring threat. Kind of crazy to think about, but those were the two things that stood out to him that I had played a good game. My perspective began to change on what was really important and what it really meant to contribute. In turn, my confidence continued to grow. The more I started to focus on the small successes the more confident I became. Not only did it help me find more success on a consistent basis, it helped eliminate the roller coaster of emotion that sometimes plagues players who only focus on numbers. I really started to realize that being a good player, and more importantly a confident player, meant doing a lot more things than scoring goals. Once my thought process changed, it became easier to find positive things to focus on which in turn helped my confidence grow everyday. Hockey and life is all about making progress. If you can get 1% more confident everyday, I guarantee you'll start to notice a huge difference in your game. So I am putting the challenge out there to all of you to start finding small little victories in everything you do...everyday. Do this in hockey and in life and your confidence will continue to grow. Do any of you currently do anything like this to help build your confidence?